Next, divide out the common factor 1,000,000,000,000 from both the numerator and the denominator of the fraction. Did you know that the first personal income tax on the American people came about during the Civil War as a way to fund the war? To learn more about the Civil War, visit us-civilwar.com or check your local listings for the History Channel, which frequently airs specials about the American Civil War. 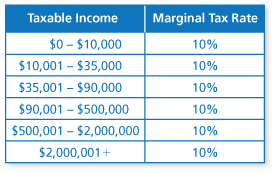 Use a graduated tax on taxable income using the following table. Eliminate loopholes by removing all deductions except for the standard deduction, personal exemptions, child care, health and education costs, and retirement. 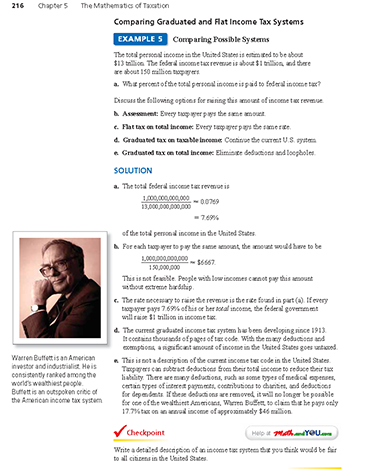 The alternative minimum tax would be abolished because there would no longer be loopholes. Capital gains would be taxed as ordinary income, except up to $250,000 in profit on the sale of your primary residence. There would be little or no changing of the tax laws from year to year, other than rate and threshold adjustments due to inflation.